Public and non-profit companies are required to provide shareholder reports for their investors. Every business can generate a ‘profit and loss’ statement or a balance sheet. As Glenn Beck pointed out in his book “Broke: The Plan to Restore Our Trust, Truth, and Treasure” (2010): Why can’t the federal government and the State of Hawaii provide a shareholder report to taxpayers, in clear, easy-to-understand language? The Federal government offers “A Citizens Guide to the Fiscal Year 2010,” paring down the Annual Financial Report to 12 pages. It gives us an overview of the US economy and the budget deficit. There is even a one-page summary of assets, liabilities, and social insurance. It’s a good start, and something we need for Hawaii. A quick search forHawaii’s budget reports gives us a wealth of information. The Department of Budget and Finance offers us Executive Biennium Budgets, Executive Supplemental Budgets, Budget in Briefs, Multi-Year Program and Financial Plans, Executive Memorandums, and Financial Memorandums. I’m glad that there is some transparency in government, but either we are overwhelmed by the large dollar amounts, or overwhelmed by obscure details and government codes. In January 2011, the Grassroot Institute of Hawaii published “The Real State of the State: An Uncensored Look at the Fiscal Challenges Facing Hawaii” – it offers a budget analysis and a select review of state departments, but it’s still 32 pages. Here’s what I’d like to see from the Hawaii Department of Budget and Finance: a simple, two page financial statement that includes a summary of spending by department, and a statement of assets and liabilities. In other words, a Profit and Loss Statement and a Balance Sheet. It shouldn’t be rocket science. But I tried to put this report together from the budgets available, and I was mired in the different budget versions and funding sources. Can anyone put together a simple, accurate financial statement for the State of Hawaii? Since the merge of the Honolulu Star-Bulletin and the Honolulu Advertiser, our state has one major daily newspaper, the Honolulu Star-Advertiser, and its companion newspaper, MidWeek. There are alternative publications – The Hawaii Reporter, HawaiiFreePress (online), and Civil Beat (online). But I am tired of newspapers that lead with accidents, violence, and natural disasters. I’d like a newspaper that focuses on constructive actions and accomplishments in our community. In addition to local, national, and world news, I’d like a newspaper that will focus on positive events and inspirational people. * School Academics: Reports academic achievements, test scores, academic competitions, student and teacher awards, scholarship winners, and student successes. * Everyday Heroes: Profiles whistleblowers, people helping others, and people who are standing up for what’s right, as well asHawaii’s community leaders and ordinary people who are making a difference in Hawaii. * Volunteer Calendar: Lists community service opportunities, including clean-ups, fundraising, calls for donations, and nonprofit organizations that need volunteers. In addition, there would be two dedicated sections about politics, to help us get involved and be informed. * Political Calendar: Lists legislative meetings and agendas, information about public testimony, town hall meetings, and public meetings. * Fact Check: Independently investigates claims, accusations, campaign advertisements, and budgets by government representatives and candidates, with in-depth coverage during election years. It would also summarize proposed and approved bills, researching assumptions, checking cost projections, and highlighting any unintended consequences. Maybe it’s too much for one newspaper to do, but it shouldn’t be hard to learn about the positive things that are going on in our community on a daily basis. What do you think? In 2008, 32% of Hawaii tax return filers paid no income taxes, according to the Tax Foundation. In the nation as a whole, 45% of US households filing tax returns in 2010 will pay no income taxes – or will receive a net tax refund, estimates the Tax Policy Center. I am concerned that we have reached a tipping point: those who pay no income taxes will be able to vote for higher income taxes on those who do pay income taxes. And those who pay no income taxes will be able to vote for more government services and more government welfare. Paying even a token amount of income taxes would change the way people feel about income taxes for everyone. So I would like to make a controversial suggestion: maybe we need a minimum income tax for everyone with earned income. There is a tax or fee for everything we do in Hawaii. If you buy something, you pay the general excise tax (GET). If you need state identification, you pay a state ID fee. If you want to drive a car, you pay a driver’s license registration fee, vehicle registration fee, and gas taxes. And if you have a job, you and your employer pay payroll taxes. Why not income taxes? There is already a minimum property tax for nonprofit organizations: $300 in Honolulu (up from $100 in 2010). I don’t have updated numbers, but it used to be minimum property taxes of $150 on Maui, $100 on the Big Island, and $25 on Kauai. It sounds reasonable to have a minimum income tax too. “Those who don’t pay [federal income] taxes – that is, who are not pulling their own weight in the community – have no real reason not to vote for more and more government services” (page 56-57), Mike Huckabee wrote in “A Simple Government: Twelve Things We Really Need from Washington (and a Trillion That We Don’t! )” (2011). I rarely support a tax increase, but this is a matter of fairness – treating everyone equally – as well as raising revenue. Should everyone pay a minimum income tax? I’m not sure I’ve even convinced myself. What do you think? I learned something interesting when I read “The Road to Serfdom” (1944) by FA Hayek. He revealed that “the most efficient technique to [change public opinion] is to use the old words but change their meaning” (page 174). What is a liberal? Even in the 1940s, the true meaning of “liberalism” had been hijacked. Hayak wrote, modern liberalism “has come to mean the advocacy of almost every kind of government control” (page 45). And he claims that it is distinctly different from conservatism, which is “a defender of established privilege” (page 46) that uses the power of government to protect existing privileges. If you are a liberal, you may believe that government should make decisions for us. But a true liberal once believed that people can and should make their own decisions. As we celebrate America’s independence, let’s remember to celebrate independent thinking too. Let’s look beyond labels like “liberal” and “conservative” or “Democrat” and “Republican” to the true meaning behind the words that politicians use. Here’s a toast to freedom and freedom of thought. Happy 4th of July! When disaster strikes in America, heroes rush in. These heroes are our policemen, our firemen, our emergency responders, our family, our friends, our neighbors. News flash: We are Superman. We are the heroes we are waiting for. 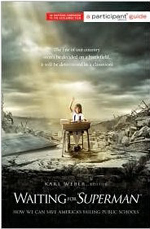 “Waiting for ‘Superman’: How We Can SaveAmerica’s Failing Public Schools” (2010) edited by Karl Weber, id a companion book to the documentary film, “Waiting for ‘Superman’ directed by Davis Guggenheim and produced by Lesley Chilcott. The book offers background information about the making of the documentary and the five children introduced in the film. But there hasn’t been enough time between the film and the book to find out whether Francisco, Emily, Anthony, Bianca, and Daisy have made it past their public education hurdles. There are essays by filmmakers, chancellors, teachers, principals, and philanthropists (but no essays written by students or recent graduates). Their writings are generally positive, passionate, and realistic about our public schools. The book also offers a list of resources and tips to get involved. 1. “If we could simply eliminate the bottom five to ten percent of teachers (two or three teachers in a school with thirty) and replace them with average teachers, we could dramatically change student outcomes” (page 98), boldly declares Eric Hanushek, author and Senior Fellow at Stanford University. That is an amazing assertion, one that can only come about when teachers can be evaluated on their merits, not their seniority. Hanushek defines a good teacher as “one who consistently evokes large gains in student learning” (page 84). He also argues that teacher certification policies end up discouraging high-quality teachers and that lowering class sizes can lead to recruiting more low-quality teachers (simply to fill positions). His writing is academic, but informative and even radical. 2. “To turn around our schools and to restore the promise of education… we need to move millions of citizens off the sidelines and into the game as tutors, mentors, citizen teachers, PTO/PTA members, education activists, and even micro-philanthropists” (page 107), asserts Eric Schwarz, cofounder of Citizen Schools. We’re already tapping citizens as volunteer coaches and sports organizers; we need to encourage people to become part-time educators. Schwarz is enthusiastic and compelling, and suggests that citizen teachers commit to 10-week “apprenticeships” to mentor students in their areas of expertise. 3. “Good schooling must come before parental support” (page 173), claims Washington Post education columnist Jay Mathews. Most of us think that parents need to get involved first to make a school better, but Mathews says it’s the other way around. He cites Jaime Escalante’s successful math program at Garfield High School in Los Angeles, California and Susan Schaeffler’s successful KIPP school clusters in Washington, DC that succeed on common principles: high expectations, more time for learning, standardized tests as benchmarks, and team spirit. These schools gained strong parental support only after the schools demonstrated improvement. For more resources and to learn how you can get involved, visit www.waitingforsuperman.com/action/. You are currently browsing the Better Hawaii weblog archives for July 2011.